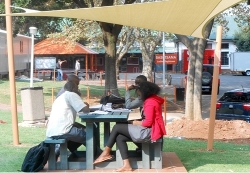 Wi-Fi on university campuses is nothing new, but the University of Johannesburg (UJ) recently increased wireless hotspot access allowing students to connect, from anywhere on the four campuses, without visiting the computer labs. Mr Andile Swartbooi, Executive Director of Information and Communication Systems (ICS) at UJ, has been overseeing the installation of the Wi-Fi, which officially began in 2010. The process, which is on-going, was accelerated in 2011 with a plan to cover all four campuses in areas such as the libraries, student centres, large lecture venues and communal areas in all the student residences. There are also a number of marked external hotspots located at strategic areas across the four campuses. “One of the key benefits is that Wi-Fi allows students to gain access to online resources from anywhere they might be on campus; this also helps to alleviate overcrowding at student computer labs. Students can use a variety of devices, ranging from laptops to tablets and smartphones, to connect to the internet, says Mr Swartbooi. UJ decided not to charge for the wireless internet access, but there is a need to ensure that students use the internet service responsibly. To this end, the University is working on a policy that will ensure that responsible use of the Wi-Fi service is adhered to. The policy will ensure that the internet is treated as an educational tool, where restrictions will apply that relate to using the internet for what it is provided for – teaching, learning and research. “Feedback from the students has been informal, mainly through the uptake and use of the Wi-Fi. While students would probably agree that the Wi-Fi is a bonus, with students no longer having to queue or walk to the labs at night, it would be great to see if academic performance will improve overall”, says Mr Swartbooi. As part of the bigger UJ ICT strategy, the Wi-Fi access is an indication of UJ’s continuous efforts in striving to be seen as a University of stature and as a sophisticated institution of higher learning. Students will have a better chance at succeeding in their academics by giving them the access to the information they need wherever they are.